Alejandro Peña-Esclusa once ran for president of Venezuela against Hugo Chavez, a man who brooks no opposition, which is why Peña-Esclusa is now in prison, based on a trumped up accusation of “terrorism.” Peña-Esclusa (Peña is pronounced Penya) is a key figure in the fight for Latin America’s freedom from Marxist dictatorship. As a journalist writing in 1994, he was the first to point out to his countrymen and the world the ominous threat that Chavez posed to democracy. He was also the first to point out the existence of the Foro de Sao Paolo (Sao Paolo Forum), an organization created by Fidel Castro that brings together all major Marxist movements in Latin America including the Colombian terrorist and drug trafficking army FARC, to create an axis of activities aimed at seizing power in Latin America. The Inter-American Institute, founded by renowned philosopher and author Olavo de Carvalho and featuring as distinguished fellows such notables as Dr. Edwin Vieira and Dr. Judith Reisman, believes it is their most crucial mission to help spread the truth about Chavez and his wrongful imprisonment of this heroic leader. And because they understand his crucial role in keeping the sputtering flame of liberty alive in Latin America, they are proud to announce their decision to nominate Mr. Esclusa-Peña for the position of Distinguished Fellow of the Institute. The pioneering work of Alejandro Peña-Esclusa in exposing Hugo Chavez and the subversive Sao Paolo Forum, is known to the Inter-American Institute. The charge of “terrorism” against this man is absurd. It is based on an allegation by Chavez-loyal police that bomb-making paraphernalia was found by police in the dresser of his young daughter’s bed room. This is the second time Mr. Peña-Esclusa was accused and arrested by these police. That time, shortly after Chavez began his presidency, the judge quickly issued a statement that there was no merit to the charges whatsoever. No one familiar with the tactics of the increasingly totalitarian regime of Hugo Chavez believes these charges. Further, just as foreseen by Mr. Peña-Esclusa, the totalitarian nature of the Chavez regime is now obvious, with broadcasting media, press and a growing number of private businesses now in the hands of the government and with thousands of refugees, mostly business people and journalists, emigrating to neighboring countries. 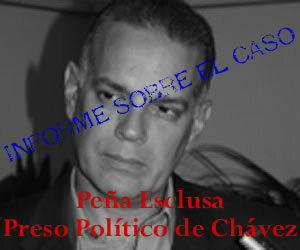 The Inter-American Institute demands the immediate release of Alejandro Peña-Esclusa.